2018 Kyushu Basho banzuke released. Discussion in 'Sports' started by Swami, Oct 30, 2018. Mongolian Hakuho will go into next month’s Kyushu Grand Sumo Tournament at the summit of the sport’s mountain in the top east yokozuna slot, according to the latest ranking released by the Japan Sumo Association. The 33-year-old is coming off a perfect 15-0 record in September’s Autumn tourney, and now has his sights set on a record-extending 42nd career title. Although he has only one championship to his name this year, Hakuho is an eight-time winner in Fukuoka and the defending champion. If Hakuho manages another title with a 15-0 record at the tourney starting on Nov. 11, it will be the first time he has gone 15-0 in two straight tournaments in over five years. However, there are concerns over his fitness after he underwent endoscopic surgery on his right knee earlier this month. The Miyagino stable wrestler has only completed two of the five championships held so far this year due to injury. His two yokozuna rivals, Kisenosato and compatriot Kakuryu, are both coming off 10-5 records in September. Kakuryu occupies the west slot, while Kisenosato is in the second east slot. All three ozeki had winning records in the last tourney, with Tochinoshin preserving his status with a 9-6 mark. Goeido is in the top east spot, with Takayasu leading in the west and Georgian Tochinoshin in the second west spot. Mitakeumi and Mongolian mountain Ichinojo continue their pairing at sekiwake for the third straight tournament. Ichinojo is in his fourth straight grand tournament at sumo’s third-highest ranking, while Mitakeumi is in his 11th tournament in the sanyaku ranks — the three ranks below yokozuna — tying him for seventh among wrestlers since the beginning of the Showa period in 1926. Takakeisho and big Brazilian Kaisei are at komusubi, Takakeisho for the second straight tourney, while Kaisei is back for the first time since September 2016. Although no new wrestlers are making their debuts in the elite makuuchi division, three wrestlers are back after stints wrestling in the second tier. Daiamami, who went 11-4 but lost the juryo championship in a playoff, returns as No. 15 maegashira. Meisei, who went 9-6 as a No. 2 juryo, returns as the other No. 15. Mongolian Arawashi will be the No. 16 maegashira after an 8-7 record as a No. 1 juryo in September. I'll be curious to see if Hakuho wrestles in November after his knee surgery. I'm also hoping the other two yokozuna and the three ozeki put in a full tourney. It's just not the same when so many top ranking rikishi are out as in the July basho. I hope Kisenosato improves now that he's back in action. 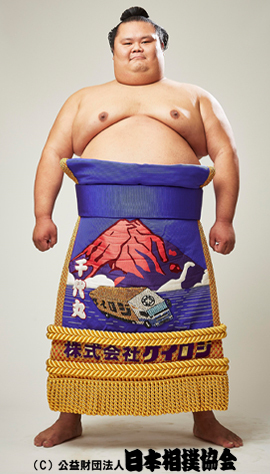 Overall I thought he did good in September but he needs to show some yokozuna style dominance in his sumo. Yes I hope Kisenosato stays in the thick of the title race this time. Chiyomaru at Maegashira #16, ouch! He needs to have a good tourney. He certainly has a unique sumo physique with his roly poly belly. Seems like no newcomers into the Makuuchi Division in November. I think he'll have trouble avoiding demotion to juryo, his balance is quite poor and he is very susceptible to losing to slap downs. At that low rank his opponents have no problem leaping out of the way. Mitakeumi holds the Sekiwake-rank for 3 consecutive tournaments. Counting since Showa Era, Mitakeumi ties now rank 7 being in Sanyaku for 11 consecutive tournaments. Ichinojo holds the Sekiwake-rank for 4 and is in Sanyaku for 5 consecutive tournaments. Takakeisho holds the Komusubi-rank for the 2nd consecutive tournament and is in Sanyaku for as long. Kaisei returns to the Komusubi rank he previously held in September 2016. It took him 13 tournaments to climb back up again. Daiamami returns to Makuuchi after 3 tournaments. Meisei returns to Makuuchi after 2 tournaments. Arawashi returns to Makuuchi after 2 tournaments. Gokushindo is the second Rikishi from Nishikido Beya to make his Juryo debut since the present Shisho founded it on the first of December 2002. The previous one had been Mitoryu in January. He is the 34th Rikiishi post WWII from Hyogo Prefecture, following Terutsuyoshi who had been promoted in January 2017. Tomokaze is the 10th Rikishi from Oguruma Beya to reach Juryo since the present Shisho founded it on the 23rd of March 1987. The previous one had been Yago in September of last year. He is the 18h Rikishi post WWII from Kanagawa Prefecture, following Asabenkei who was promoted in November 2015. Additionally, he is the 10th graduate of Nippon Sport Science University to achieve this. The previous one had been Chiyonoumi in July. Moreover, he is the129th Rikishi successful in amateur Sumo as a student to reach Juryo. The previous ones were Chiyonoumi and Churanoumi in July. Toyonoshima has returned to Juryo after 13 tournaments, the rank he previously held in September of 2016. Being 35 years and 4 months of age, he is now the 6th oldest Rikishi post WWII to achieve this. One would think he'd learn to counter that move, the slap downs, by this point. He did surprisingly well a few bashos ago but has been mediocre ever since. If I was to bet, Ichinojo will either loses his Sekiwake rank this time around or he gets his kachi-koshi on day 14 or 15. Ichinojo is just becoming a slow, lumbering target, most rivals will try to move too quickly for him rather than get into a belt battle with him. Mongolian grand champions Hakuho and Kakuryu will both withdraw from the upcoming Kyushu Grand Sumo Tournament due to injuries, their respective stablemasters announced Thursday. Following surgery on Hakuho's right ankle and right knee last month, his stablemaster Miyagino said the 33-year-old yokozuna lacked sufficient preparation for the Nov. 11-25 tournament at Fukuoka Kokusai Center. "He hasn't recovered yet (from the knee surgery). He says it's still painful," Miyagino said. "I'm sure he wanted to compete in the last Kyushu meet of the (current) Heisei era. It can't be helped. He's getting better," he added, but Hakuho did not speak to reporters after a morning training session. Kakuryu is sitting the tournament out due to pain in his right ankle and right knee. It will be his 11th withdrawal and first since pulling out partway through the July meet in Nagoya with a right ankle injury. Their absence puts pressure on Kisenosato, the remaining grand champion, to perform well over the full 15 days and ensure there is at least one yokozuna competing. It is the first time Kisenosato will open a tournament as the sole grand champion. It will be the 10th time in Hakuho's career that he has missed part or all of a basho, and first since he pulled out on the fourth day of the 15-day Nagoya tourney in July. He has only gone the full distance in two of the six grand tournaments this year. Hakuho had a procedure to remove bone fragments from his knee and fluid from his ankle joint shortly after he experienced pain and left the 24-day autumn regional tour on Oct. 12. Miyagino revealed that Hakuho can barely execute a shiko, a basic sumo warmup movement, and will remain in Fukuoka for rehab. But he also said he is optimistic for Hakuho's comeback in the New Year meet in January and expects him to join the promotional tour which starts Dec. 2. With his likely withdrawal from all 15 days of the Kyushu tourney, Hakuho will finish the year with 31 wins, eight losses and 51 rest days. His sole overall victory this year came at the Autumn Grand Sumo Tournament in September, when he secured his record-extending 41st championship with a perfect 15-0 record. If, as expected, he does finish 2018 with only one tournament victory, Hakuho will see a run of 11 straight years with at least two grand sumo championships end. The last time he won a single title in a year was in 2006 when he took his debut crown at the summer meet in May. Wow! Not too surprised with the news on Hakuho pulling out with his recent surgery but I was hoping to see Kakuryu compete for his third Emperor's Cup in '18. I hope Kisenosato stays healthy and competes all fifteen days. This is a real opportunity for him to win a basho after his long absence. This certainly could be interesting to watch. It really does pile the pressure on Kisenosato to win this time. Could be a pretty open tournament if the ozeki all do well. Indeed! I hope all three ozeki stay healthy. I'm looking forward to Sunday. All eyes will be on Japanese yokozuna Kisenosato when he starts the Kyushu Grand Sumo Tournament on Sunday as the sole grand champion in competition following the withdrawals of Hakuho and Kakuryu. Kisenosato, entering a tournament as the sole yokozuna for the first time, will start the 15-day meet at Fukuoka Kokusai Center with an early challenge against komusubi Takakeisho on Day 1. The first wrestler from the now-defunct Takanohana stable to reach "sanyaku" -- the three ranks below yokozuna -- Takakeisho has beaten Kisenosato twice in four bouts. The 22-year-old komusubi has posted winning records at the last three grand tournaments. Kisenosato, however, appears in good shape following his comeback run at the Autumn tournament in September. He fought his way to 10 wins after withdrawing from eight straight meets, the most by a yokozuna, due to a lingering left chest muscle injury. The 32-year-old Ibaraki native will face what should be an easier test on Day 2 when he takes on top-ranked maegashira Myogiryu, against whom he holds a 16-4 record. Myogiryu, a two-time kimboshi prizewinner for defeating a grand champion, has yet to beat Kisenosato at the sport's highest rank. Kisenosato is seeking his second top-division title and first since winning in his yokozuna debut last March, when he became the first Japan-born grand champion in 19 years. Hakuho, an eight-time winner in Fukuoka and the defending champion, opted out of the final meet of the year as he is still recovering from right knee surgery last month. The Mongolian grand champion secured a record-extending 41st championship with an undefeated run at the Autumn tournament. His compatriot Kakuryu, who went 10-5 in September after suffering five consecutive late losses, decided to withdraw with renewed concerns about a right ankle injury he sustained at the July meet in Nagoya. Among other top-ranked wrestlers, ozeki Goeido and Tochinoshin should have straightforward opening bouts against No. 1 Hokutofuji and No. 2 Tamawashi, respectively. Fellow ozeki Takayasu faces a stiffer challenge against Myogiryu, who has won 11 of their 15 match-ups. Among the three sekiwake, Mitakeumi, whose bid for an ozeki promotion fell short with a 9-6 result following his maiden makuuchi title in Nagoya, will take on No. 2 Tochiozan. Ichinojo, at the third-highest rank for the fourth straight tournament, squares off against No. 3 Nishikigi. Kaisei injured his left leg in practice on Tuesday and withdrew from the opening matches. His stablemaster Tomozuna said the Brazilian sekiwake plans to enter the tournament after resting for about three days. Sad to hear Kaisei being out for the opening matches as well, hopefully he makes it in. It looks like the opening matches will be interesting. I really hope Kisenosato can do well this time, Tochinoshin as well after surviving that scare in September, having to protect his rank.